Don’t look too closely at the quasi-burned carrots. The stove I was cooking on was WAY hotter than I am used to! This was the first meal that I cooked in the New Year. Our nephew is recently divorced and hadn’t had a home-cooked meal in, well… many months. I thought it perfect that, since we live near him, I cook him a good meal. He loved it so much that I think we are going to do this more frequently. 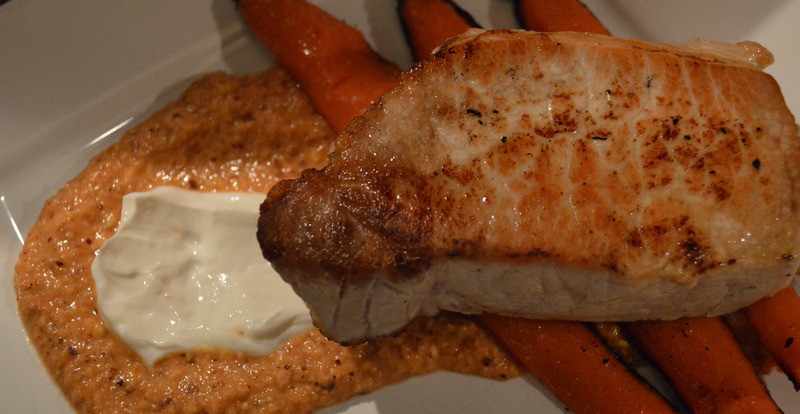 Sous Vide pork chops is lesson 3 from the “Cooking Sous Vide: Getting Started” class (free!) from the fantastic team at Chef Steps. I did not use the ChefSteps romesco, though, but rather the one from Fine Cooking, which you can find here if you are unfamiliar with the technique. I had a craving for a tomato and garlic base, rather than the pepper base. Of course tomatoes are horribly out of season (even hot house tomatoes aren’t that good), so it wasn’t as good as it could have been with fresh farmer’s market tomatoes. But it was still really delicious! I added a bit of fresh Fage plain Greek yoghurt, which was so creamy, cool, and delicious — the perfect counterpoint to the spicy bite of the raw garlic in the romesco. In fact, if you are at all considering leaving out the yoghurt? Don’t. You really do want it. Prior to cooking, I did a sage and garlic brine on the pork chops, and it brought me to an interesting learning place. In researching sous vide cooking, seasoning your meat prior to water-bathing can really ruin your protein. Before I went whole hog and ruined my pork chops, I decided to check in with the informative forum on ChefSteps, which gave me a very quick response, but introduced a cool new technique: equilibrium brining. All brining and curing is a diffusive process. That is to say that ions, molecules, and atoms cross a cell wall from a place of high concentration, to a place of low concentration. In this case your salted water (high concentration of salt) diffuses across the cell wall of your protein (low concentration of salt) to create a higher concentration of salt in that cell. Since salt also retains water, brining increases the juiciness of your protein, in addition to it adding more flavor. Equilibrium brining uses a slightly lower concentration of salt than a traditional brine. Usually I use a ratio of salt to water that is based on the weight of the water that you would need to submerge the protein. (Ruhlman writes a little about determining the brine ratio here but otherwise has a whole book dedicated to determining ratios) Equilibrium brining uses a percentage based on the total weight of the protein plus the water that you would need to submerge your meat in. It takes a little bit longer than a traditional brine because the salt concentration is lower, but the technique also keeps you from over-salting/brining your meat. No one likes to eat a salt lick. The idea that was introduced to me was that you could potentially brine your meat and cook it in the sous vide at the same time. Whoa! The segment on equilibrium brining shows the cooking process after the brining process, but an interesting comment in the forum said otherwise. I will fill you in on what would need to change when I hear back. 1. Normally you put oil in your bag prior to cooking it in the sous vide, so do you sub out your oil for the brine and then cook it in the sous vide? 2. Can you hold your protein in the sous vide long enough to go the length of the brining time? This entry was posted in Meat, Modernist Cuisine, Sous Vide and tagged Equilibrium Brining, Pork, Sauce, Science, Sous Vide. Bookmark the permalink.